President Donald Trump’s decision Friday to sign a spending bill without significant border wall funding ensured that he won’t fulfill one of his top campaign promises before the 2018 midterms. But that’s not to say Trump hasn’t already reshaped U.S. immigration policy since taking office. The changes started almost immediately after Trump was sworn in. The president signed two executive orders in January 2017 that imposed stricter immigration enforcement measures at the border and called for an increase in the deportation of undocumented immigrants inside the U.S. Since then, immigration advocates have consistently criticized Trump’s stricter immigration policies, while supporters have cheered the changes. Here’s a look at some of the major immigration policy changes of the Trump era so far. Deportations decreased in fiscal year 2017 compared to fiscal year 2016, according to a Department of Homeland Security report released in December. The DHS report also found that the number of arrests of suspected undocumented immigrants was up 30 percent. Thomas Homan, the acting director of U.S. Customs and Immigration Enforcement, attributed the lower deportation number to stricter enforcement policies and a decline in border crossings. In February 2017, the Department of Homeland Security issued two memos detailing how the agency would carry out Trump’s executive orders on immigration. The guidelines expanded the Priority Enforcement Program, which DHS put in place under President Barack Obama in 2014. 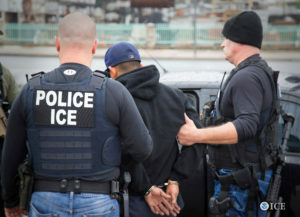 The program prioritized arresting and deporting undocumented immigrants with criminal convictions and those who pose a threat to public safety. The DHS guidelines under Trump prioritized going after undocumented immigrants “who have been convicted of any criminal offense,” a change from the Obama era when law enforcement targeted immigrants who had committed serious crimes. Critics and immigration experts have argued that the stricter policy led to the rise in ICE arrests in Trump’s first months in office. 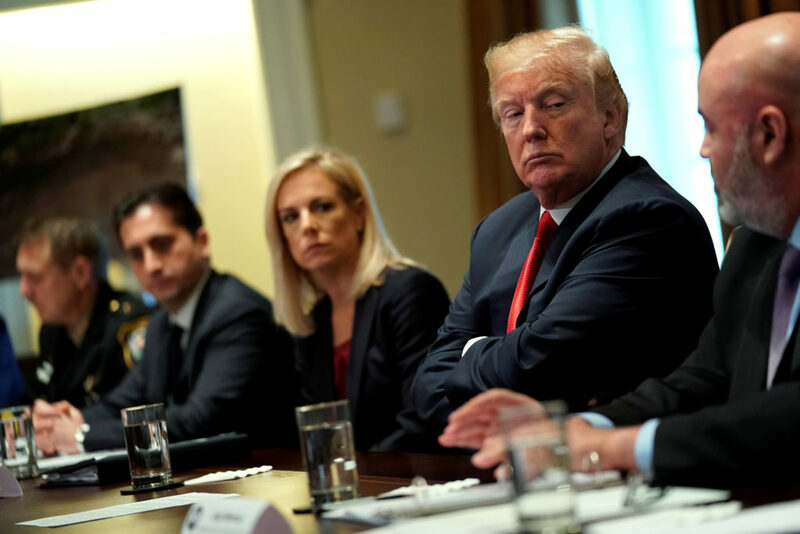 “There’s always a lag between arrests and removals, but what is more surprising with the Trump administration is their removals have kept more at pace with arrests than prior times,” said Muzaffar Chishti of the Migration Policy Institute. The number of arrests of noncriminals has doubled under Trump since the DHS guidelines took effect, reports show. Under the Obama administration, immigration judges often exercised prosecutorial discretion in cases involving undocumented immigrants with no prior criminal offenses whose only crime was illegal re-entry into the U.S. In 2017, a DHS memorandum rescinded almost all prosecutorial discretion — the authority that a prosecuting attorney has to bring charges and to try a case — in immigration cases, except in the cases of children who were brought to the country illegally and the parents of legal children. In an effort to address the backlog, the Department of Justice added 50 new immigration judges in 2017, and in a memorandum said it was planning to add over 60 more in the first six months of 2018. The end to the practice of prosecutorial discretion has put undocumented communities on edge, Chishti said. “The level of anxieties in these communities are extremely high because there is absolutely no guarantee if you’ve been apprehended by ICE that you’ll not be removed,” Chishti said. Chishti said his group, the Migration Policy Institute has found the number of people who report crimes, including instances of domestic violence, and are willing to be witnesses in cases has gone down because people don’t want to face the possibility of being arrested. In recent months, immigration advocates have stepped up their criticism of the Trump administration for separating parents from their children when families are apprehended at the border by law enforcement agents. In December, the American Immigration Council and other advocacy groups filed a complaint on behalf of 15 individuals, including a toddler, who had been forcibly separated from their families by border patrol agents. Critics claim the practice of separating parents from children has risen under Trump. “It has the attention of advocates and policy makers and I think DHS needs to be held accountable for these practices,” Noorani said. The ACLU expanded an existing lawsuit earlier this month claiming the government illegally separated hundreds of families. In a statement to PBS NewsHour, DHS Press Secretary Tyler Houlton said that “separating women and children” is not agency policy. “DHS does not currently have a policy of separating women and children. However, we retain the authority to do so in certain circumstances – particularly to protect a child from potential smuggling and trafficking activities,” Houlton said. The issue only appears to be gaining more traction. Earlier this month The Washington Post reported on a Salvadorian family seeking asylum in the United States whose three children were held in a separate detention facility across the country from their mother without explanation. And in February, 75 members of Congress sent a letter to DHS secretary Kirstjen Nielsen criticizing the practice.